Fires are one of the biggest hazards to any business, which is why you need the best possible fire alarms. Keeping your business safe means preventing any hazards that might threaten your customers, employees, and visitors. Fires are one of the biggest hazards to any business, which is why you need the best possible fire alarms. Here are two examples of effective fire alarms and why you should consider adding more of them to your commercial building. Although fire protection is essential, sometimes fires will start regardless of what you to to stop them. 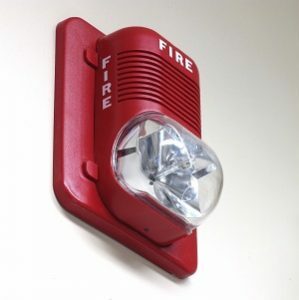 A photoelectric fire alarm detects fires using a beam of LED light. When the smoke from the fire enters the chamber of this detector, the light beam is disrupted. Then, the light particles of the LED beam are interrupted, triggering a signal to the alarm and activating it. Fires don’t always immediately roar to life. Sometimes embers and sparks will burn for a long time before the flames rise high enough to trigger alarms. Then they will spread before anyone notices. That’s why you need to have photoelectric fire alarms in your building. However, it’s also a good idea to have ionization-based fire alarms in your building as well. That’s because ionization fire alarms can respond to fires that are quickly spreading out of control. These alarms use a metal plate with an electric current flowing between them along with a battery and a material called Americium-241 that all work together to sense smoke and activate the alarm if excessive levels of smoke are detected. Without fire alarms, you wouldn’t know it’s time to evacuate whenever a fire happens. Fires can happen due to accidents, crimes, or malfunctions. No matter what starts the fire, the important part is to keep everyone and everything in your business as safe as possible. That’s why you need emergency lights and brightly lit exit signs, which come in handy during a blackout or other outage event. How many fire alarms you need depends on local laws and regulations, along with occupancy codes and technological sophistication. Make sure all of your fire alarms are properly inspected, well-maintained and are promptly replaced when they start to age and become unresponsive. As a building owner or property manager, you might not know where to get started. That’s why you should rely on the experts at ARK Systems to guide you through the process. Located in Columbia, Maryland, ARK Systems provides unsurpassed quality and excellence in the security industry, from system design all the way through to installation. We handle all aspects of security with local and remote locations. With over 30 years in the industry, ARK Systems is an experienced security contractor. Trust ARK to handle your most sensitive data storage, surveillance, and security solutions. This entry was posted on Thursday, December 6th, 2018 at 9:58 am. Both comments and pings are currently closed.